Document pages that have associated audio display the speaker icon in the menu bar. Click the speaker to toggle display of the audio player. Click to play, click again to pause. You may have to wait a moment or two the first time you click play before the audio begins so have patience. This shows the amount of time elapsed since the audio started playing and total length of the recording. Click here to move the audio playback to the start of the previous paragraph. Click here to move the audio playback to the start of the next paragraph. The "P" stands for "Play from Here". When clicked, the "P" turns red, and a appears at the head of each paragraph. Clicking any play symbol will cause the audio to begin playing from that point. Note: Doing this can cause a the audio to get out of sync with the highlighting of the current paragraph. I would love to correct this problem but have not yet found a solution. 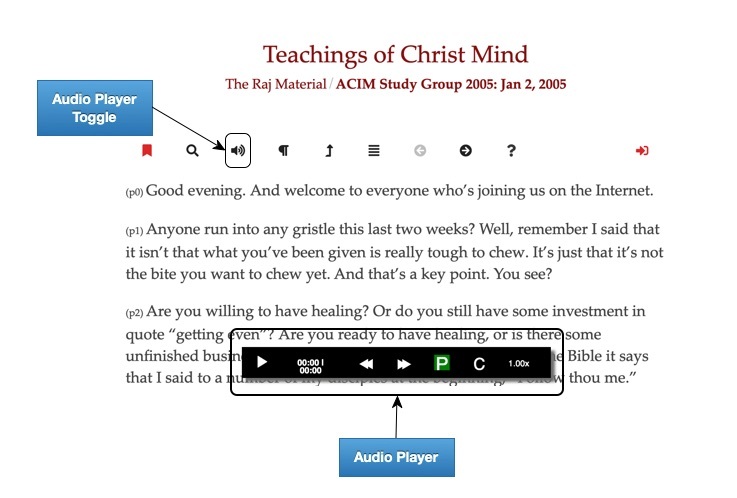 This option is visible to users who have an account and have agreed to help gather timing information used to synchronize the audio with each paragraph in the document. We call them timers. This option is visible to timers and offers the ability to slow down or speed up audio playback.